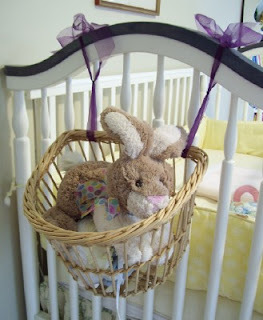 Updated: Due to the comments regarding safety, I have removed the basket tied to the crib. I think I can tie it to the back of a chair instead. Still, a cute pair of baskets for 50 cents! And here again is the monogrammed dress I found at Goodwill for $2.50. Several of you wondered how I find these things--well, we probably live in the monogramming capital of the world! 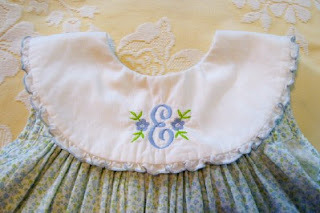 I have passed up several darling dresses which did not match my daughter's initials. In fact, when I spotted this one, I said to myself, "Such a shame...wait a minute! It's an E!" 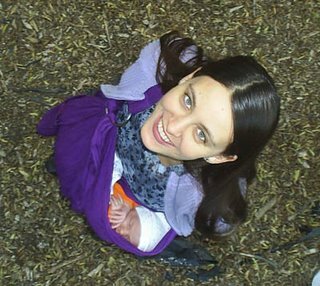 Now, I know it doesn't matter to anyone how well my daughter is dressed, but it does make me happy to recycle such beautiful clothing! What a lovely dress! I'm always on the look out for things with a B for Brenna. Would you mind telling me which Goodwill you're looking at? I'm a conspiracy theorist and think that they are purposefully sending the good stuff to certain sections of town. There are never good kids clothes at the two Goodwills on our side of town.